Tsavo National Park Kenya Hotels and Lodges - Photos, Entrance Fees. Tsavo National Park is the largest park in Kenya and consists of two separate parks, Tsavo East and Tsavo West. Altogether, Tsavo measures 21,000 square kilometers. The park is located between the cities of Mombasa and Nairobi and straddles the highway used to travel from one to the other. Tsavo National Park is known for its abundance of wildlife as well as a variety of geological features such as Mudanda Rock and Lugard Falls. Because Mudanda Rock towers over a natural dam, it is a good place to see elephants and other park inhabitants in the dry season. Other important features include the Yatta Plateau and the Aruba Dam. Tsavo is a Maasai word, which means ‘river’ and is the largest game reserve in Kenya. The park is divided into two main national parks, namely Tsavo West and Tsavo East and it stretches all the way to the Tanzanian border. This is one of the largest parks in the world as it is estimated to be 2.5 times larger than the Yellowstone National Park in the United States. Tsavo covers a cast land that is approximately 12,000 square kilometers. This is believed to be one of the prehistoric sites, as there have been fossils have been found and used as evidence of existence of human beings in the Stone Age. Both Tsavo West and Tsavo East provide park guests with the opportunity to view a diverse collection of wildlife. Tsavo East is many times larger than the Maasai National Reserve. This park is famous for its huge herds of elephants covered in red dust. You will also have the opportunity to see crocodiles, Cape buffalo, and lions. The park is home to a heavily monitored breeding population of black rhinos. Rangers monitor the rhinos and track them through the bush to keep them safe from poachers. Bird enthusiasts should note that Tsavo East is home to over 500 species including hornbills. Tsavo West is about half the size of its sister park but offers much more variation in its terrain. Its grasslands, shrublands, and woodlands are home to some of the same species found in Tsavo East like lions, Cape buffalo and elephants, but guests can also get views of cheetahs and hartebeest. It is not unusual to see tortoises plodding along the roadside or giraffes nibbling at treetops. The varied landscape provides protection to several different endangered species such as Cosen’s gerbil. Bird species in Tsavo West include the corncrake and the Basra Reed Warblers, both of which are threatened. Tsavo National park is home to the Tsavo Lions. Tsavo lions look slightly different from the ordinarly Masai lions. The males have smaller manes. This might be because the weather in Tsavo is hot and huge manes like those of the Masai Mara lions would only bring unnecessary warmth to the animals. The Tsavo lions came to light after two male lions terrorized railway workers in the late 1890s. The two Tsavo lions later came to be known as the man-eaters of Tsavo. Many species of wildlife are found in this national reserve since it is quite vast and has the ability to accommodate a wide variety of animals. All the common animals like the big five and the small five are found in the reserve. There are other unusual animals also found in this area like white-tailed mongoose, Aardwolf and the large spotted Genet among others. There are over 500 different species of birds that have been recorded in this game reserve. Anyone who is interested in enjoying the rich diversity of Kenya should ensure that they visit these two national parks. Despite the fact that this one of the biggest parks in the world, Tsavo National Park does not have many hotels in the Parks. It is however hotel to some of the most beautiful hotels. Tsavo hotels like Sarova Salt Lick let you get as close as possible to some of the biggest African Elephants you will ever see. 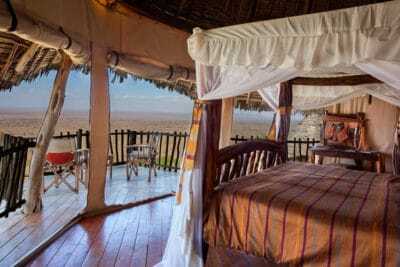 Unfenced Tsavo hotels like Lions Buff camp take the wild experience to another level. In one of our Safaris, we encountered the Tsavo lions right at the reception of Lions Buff camp. That’s how close one can get to the wild animals. You are however asked to walk with a Masai Guard since the Masai Morans have a great understanding of the Masai Lions. 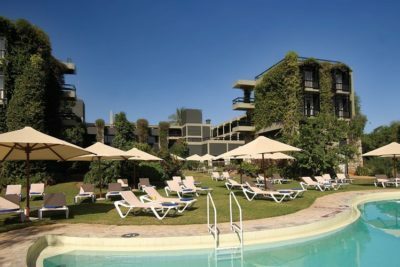 If you are looking for some Luxury, Tsavo hotels like Finch Hattons will leave you longing to stay longer in the Tsavo. 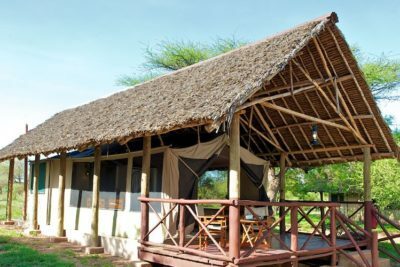 This lodge is only a short distance from the Mtito Adei Gate. The lodge has its own watering hole, which is visited by plains game every day. The lodge’s cool, quiet atmosphere makes it perfect for observing wildlife. 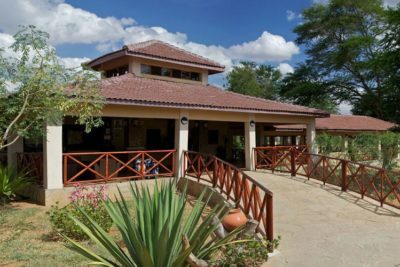 The Ashnil Aruba Lodge lies at the heart of Tsavo East and is located on the banks of the Aruba Dam. The dam was constructed to add sport fishing to the park’s list of attractions. Several nearby watering holes make it easy to spot local fauna. Here you will get a magnificent view of Mount Kilimanjaro as well as opportunities to view the many different wildlife species that Tsavo West offers. Its location on the Sante River is also home to turtles and hippopotamuses. 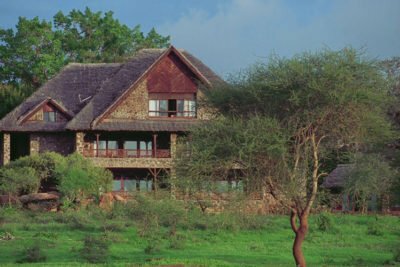 One of Kenya’s most famous lodges, this lodge is renowned for the hospitality of its staff as well as for its location. It overlooks a watering hole and the Tsavo plains. Because the lodge is constructed on stilts, guests are able to view game in all directions 24 hours per day. 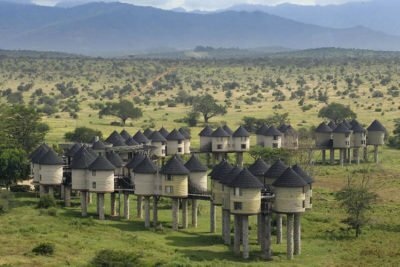 Located in the Taita Hills Wildlife Sanctuary, this lodge offers guests luxury as well as excellent game-viewing opportunities. The lodge consists of more than 28,000 acres and is unfenced so elephants and other animals can roam with relative freedom. There are so many things that are seen in these two parks, with the main area that receives visitors being known as the Developed Area. This is between the Mombasa highway and Tsavo River, where there is a great combination of magnificent landscapes. There is a railway line that provides a natural divide between the two parks. The Galana River is also within the game reserve and serves as a major attraction. There is also the great triangle of flat wilderness that has Aruba Damin. Shimba Hills is also one of the key attractions within the park borders. The Mzima Spring is found under the Chyulu Hills and is a natural water reservoir, which attracts quite a number of visitors. The Yatta Plateau is also a historic sight to behold. This is the considered to be the longest flow of lava in the world. If you are looking to escape the beaten path, Tsavo National Parks is an awesome park to add to your itinerary.